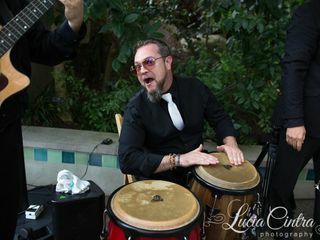 We had The Move Makers band for our New Years Eve wedding on 12/31/17. We cannot even begin to express how incredible this band is. From the very beginnning, the bands manager, Sienna, worked with us to help our vision for the night come to life. She was able to help steer us in the right direction and made some recommendations for songs that turned out to be our favorite! The entire band is professional, friendly, and just downright talented. 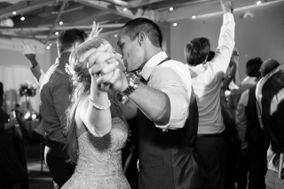 They made our wedding go from a wedding to a New Year’s Eve party that our guests are still raving about! As a testament to how they delivered, my parents booked them immediately for my sisters wedding next year. Thanks again to The Move Makers Band for such an incredible night! Hands down the best band! From the beginning to the very end we could have not asked for a more fun or professional experience. The music was AMAZING and the dance floor was packed! My guests are still raving about how much they loved the band and the wide range of music they covered through out the night. I highly suggest booking them for your wedding or event, you will not be disappointed! The Move Makers made our wedding absolutely ROCK. I can't believe how easy Sienna was to work with. She took care of anything and everything I wanted ahead of time and I was blown away by the performance they provided the night-of. I cannot recommend them enough if you're looking for a FUN and MEMORABLE wedding experience. Sienna worked with me to create the perfect set list-- an eclectic mix of old and new songs I knew would be hits with our crowd. Our guests are still talking about The Move Makers, and so are the neighbors who heard them from down the street. They are not a 'wedding band'... each member is clearly an experienced and well-trained career musician. I knew it from the moment I heard them play live. Fantastic. We booked them as soon as we got engaged, one year in advance, and I highly recommend doing that! BEST BAND EVER! #hornsection #makestheparty #movemakers! Thank you Alexanna! You and Art are such a cute couple and that had to be the best house party I've been to in a long time! You guys are amazing! Having Move Makers was one of the best parts of our wedding! Everyone loved the dance and music! The Move Makers did a phenomenal job for our wedding in May. They are truly talented musicians. Our guests couldn't have been more happy with the music selection and performance. No one stopped dancing, even the horn section got on the dance floor! From the planning process to the day of, the Move Makers made our wedding so special. Sienna, the band manager does a great job and is very responsive. I would highly recommend this band to anyone. My family and I listened to several bands in the area, and nothing compared to music and spirit of the Move Makers. Thanks Move Makers for making our wedding amazing! Thanks Carly! We really had a great time with you all and it was an absolute BLAST! Thanks again for letting us be a part of your special day! I could not recommend the Move Makers more highly! The band played at our Nov, 2016 wedding at the Omni William Penn hotel, and we would hire them again without hesitation. They truly made the evening into a party! We have been to so many weddings in the past year, and the Move Makers stood out by far as our favorite band. In particular, we liked that they covered such a wide range of songs (including lots of current songs) and they have a really exceptional brass section. They were energetic and kept the crowd energetic all night. In fact, so many of our guests commented about how much they enjoyed the band. In addition to their music quality, the band was absolutely wonderful to work with. Their manager, Sienna, is very kind, highly responsive, and flexible. We shared our ideas with her about the ceremony processional and recessional music and the genre of music we would like for the cocktail hour. Sienna took note of all of our preferences. She worked with the band to figure out the right instrumentation for the ceremony and cocktail hour to complement the songs we had requested, and the band even made a special arrangement of a song that we like. They added the ceremony and cocktail musicians and additional ceremony/cocktail sound equipment at a *very* reasonable price. 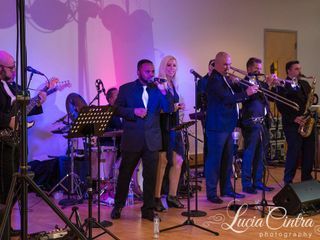 We also provided Sienna with requests of songs we did and didn't want at the reception, and the band followed our requests to a T. At the risk of sounding redundant, the Move Makers were top-notch in their music quality and in the experience of working with them! I would recommend the Move Makers 100 times over. Leading up to our wedding, they were the easiest of all of our wedding vendors to work with. Seriously. Sienna was prompt, kind, helpful, excited, and patient - all of which made the planning experience painless. As for their actual performance, I had never heard them perform live before our ceremony (my parents scouted them out for us) so needless to say I was a little nervous. Within seconds of hearing them play, all of my music-related nerves melted away. They were SO GREAT. The ceremony music was beautiful, the softer music during cocktail hour and dinner were perfect, and most importantly, during the reception, the dance floor was never empty. They performed our special requests flawlessly, and we had SO MUCH FUN. Thank you, Sienna and co. for everything. You went above and beyond. We couldn't be more grateful. Thank you Lee! We had such a blast with your friends and family, you all really know how to throw a party!! So happy we could be a part your new beginning with Jamie! Saying The Move Makers Band is amazing is an understatement. They were great to work with from the beginning planning stages to the end of our wedding reception. 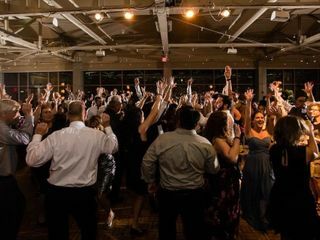 Their ability to entertain was proven as the dance floor was packed from beginning to end and our guests were still screaming for an encore. Their sound was spot on and filled the room perfectly. Sienna, the band manager, was phenomenal to work with and proactive in making sure everything went smoothly throughout the evening. We had special song requests and she ensured they were executed at 110%. We can't thank them enough -- they truly made our wedding day so special and we'll remember it forever. We would recommend them to anyone for any special event! Simply put, the Move Makers are the best wedding band I have ever experienced. Period. If you are getting married in the Pittsburgh area, there is no better alternative for value or quality than the Move Makers. 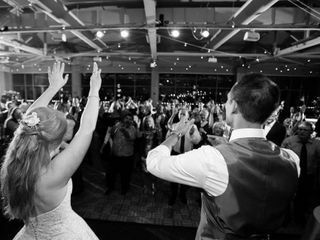 My wife and I had the Move Makers play our 3/6/2016 wedding at the Pittsburgh Opera House. We saw a number of other Pittsburgh bands before we made a final decision, and NONE ever came close to the Move Makers (sorry Bachelor Boys). From our first interactions with the band's manager, Sienna, to the final encore song they agreed to play that night, the band wowed us and far exceeded every expectation we had for them. Let me start with Sienna, the band's manager. Sienna is an absolutely pleasure to work with. Months before our wedding, Sienna tirelessly responded to our questions, helped facilitate a smooth contract signing, worked with us for ALL of our special requests, and made sure that on our big day set up, performance, and tear down were a breeze. You will love working with her! The band is a group of unbelievably talented and incredibly versatile musicians. 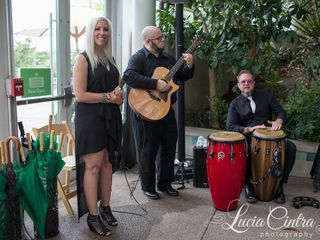 The Move Makers provided a classical guitarist for our ceremony processional/recessional, a smooth swinging jazz quartet for our dinner, and an UNBELIEVABLE 10 PIECE BAND THAT KEPT OUR GUESTS DANCING THE WHOLE NIGHT. The band learned several special songs for us to truly make the night memorable. The band's horn section is INCREDIBLE. The male and female vocalists had range to cover everything from Motown to Top 40. The band put together a perfect set that built over the course of the night, allowing some of our older guests to enjoy a few slow songs before building to an incredible climax hours later. Several of our guests said that this was the best band they had ever heard...wedding or otherwise. I very rarely post such reviews online, but Sienna and the Move Makers have earned this praise. Do yourself a favor and look no further than this band for your next special occasion! Thank you Matt! You and Natalie were also a joy to work with and now I can't believe it's over! Definitely in our top five favorite couples! Have an incredible journey together. This band is terrific - absolutely the best!!!! I am not even sure where to begin. The singers are fabulous, the band is the coolest. The Move Makers sent me their playlist and told me to feel free to add any songs we wanted and they would preform it. Their list is extensive and they cover all genres and past favorites to current top 40's. They interact well with the guests and are so fun and gracious. My guests were thrilled with the band and we danced all night! Their manager, Sienna is efficient, polite, competent, and very accommodating. Sienna took the worry out of everything! I would recommend The Move Makers for anything from a corporate party to a fund raiser to a wedding. They are simply the best!!!!! 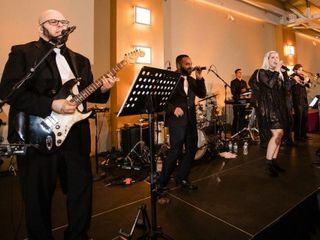 We took a gamble when we were looking for a wedding band- we found a new, hip, and talented band called The Move Makers, but back in the Fall of 2014, they had just formed and hadn’t played any weddings yet. They were unique in that they welcomed us to come listen to them practice (and took a few song requests! ), which other bands in town refused to do. Their music turned out to be amazing in person, so we booked them. Their manager, Sienna, was always very easy to work with, always responsive, and really cared about making our wedding great. We saw the band at a few performances before the wedding, and they are all very friendly and talented. We felt very at ease that they would take care of everything. Sienna also communicated well with our wedding coordinator, and a friend who was doing some DJing. Even though there were a few changes in band members since the time of booking, they were quick to find new alternatives that were just as talented. The wedding reception music itself was stellar! The dance floor was always hopping, and they had an excellent mix of songs, from the classics to fun recent songs. They did an excellent job of covering every song they played. When our wedding ran late, they adjusted to the schedule, and played past the anticipated end time with no questions asked. All of our guests commented on how great the band was. Ultimately, we could not have been happier with The Move Makers, and would recommend them to anyone looking for a live band! What a great time and epic evening. You will always be very special to us. Though you weren't our first reception, you will always be our first booking. Thank you! OUTSTANDING!! The band was super responsive, friendly and professional from the minute we hired them. They were very open to suggestions for playlist. But most of all, the quality of this band was one of the best live bands I've ever heard! The guests still rave about them. Many people want to find out where else they play to see them again. These are professional musicians. Their sound is tight and they are well-rehearsed. Their manager is extremely competent and easy to work with. I would highly recommend the Move Makers Band for weddings, or any type of event. Their playlist is extensive, and they are extremely accommodating. You can't go wrong with this group! Long overdue review for a great band. Fun to work with, they really listened to what we wanted and personalized the music to our theme. 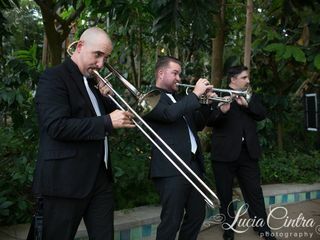 They worked with our cocktail hour steel drummer to blend the recessional song with his first song, it was just great! I still get compliments a year later about how much fun people had on the dance floor. Pro tip: we offered to pay in full up front, and they knocked 10% off the price. Don't hesitate to hire these guys, and be specific about the songs you want -- my one regret was that I had wanted a particular song to be played, but I didn't speak up since it was on their regular song list anyway, and they didn't happen to get to it. So, don't be like me -- they will listen to what you want and make it happen!